I cannot believe how generous everybody has been, offering their writing skills to me! I am happy to begin this week with yet another guest post, coming from Julia if Blue-J Cottage. Julia teaches dance and is also a really prolific quilter and seamstress. She got married this summer and made her own wedding dress! Her level of sewing competence is something I am only dreaming of! Today, she is telling us about one of her favourite cities. Off you go! Hi! My name is Julia and I blog over at Blue-J Cottage. I blog about mostly sewing and crafting things, and sometimes other interests in my life too. I hope you'll stop by sometime! 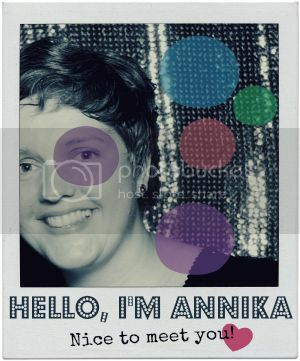 Annika and I have become blog friends through Pay It Forward. To be honest, I am not sure how we found each other....but I know that she joined my Pay it Forward and then posted her own and by commenting, I joined hers! Anyway, Annika asked for other bloggers to guest post on her blog while she was on vacation, I happily said I would love to! And since we are on the topic of vacation, what better topic to blog about?! One of my favorite places to vacation is....CHICAGO! It is such a fun town and has so many neat things to see and do. And it is close enough that it is only a short drive or a super fast air plane trip. Growing up, my family would go to Chicago just for a weekend getaway. That is when my love for Chicago started. Especially when the American Girl Store opened! I was in HEAVEN! And later when I was in high school, we went again to their Christkindl Market (German Christmas Market), that was a lot of fun too. During my college years, I studied Dance Education and German Education. Because my majors were education based, I had to do student teaching. I chose to do my Student Teaching section in the Chicago Public School System. It was so much fun! Living and teaching and commuting everyday in Chicago. The Art Institue of Chicago has "Free Family Wednesdays! The Art Institute of Chicago is free to Illinois residents on the first and second Wednesdays of every month." Now, I am not an Illinois resident....BUT they never checked my ID when I went in. (This isn't fool proof...but I am pretty sure I have done this about 4 or 5 times). Oh and Millennium Park! Has so many fun things to do and see. The big "Bean". The spitting walls. The walkway from the art institute. The amphitheater. It is a really awesome, interactive park. Definitely worth checking out! The Navy Pier is a fun spot too. The ferris wheel has great views. The Chicago Children's Museum is there. And yummy, Bubba Gump Shrimp Co.
And the Magnificent Mile?! So many shops! So little time! So for families (or even friends) there is a ton to do during the day. And that is just a hint of all the fun things Chicago has to offer! John Hancock Tower's Signature Room. Great views of the city! And fun atmosphere! The Hangge Uppe. Plays current music upstairs and 80s, 90s and other oldies downstairs! Chicago has so much to offer and is such a WONDERFUL town. If you haven't been there already....you should check it out! Thanks for letting me guest post today! Come visit me at Blue-J Cottage! Hey, this was a great post! Thanks very much for taking the time and sharing all your fave things to do in the Windy City, Julia! Definitely makes me want to put Chicago on my list of must-see places! And I think you would make a fantastic travel guide! Chicago looks like a great city to visit!! thank you and I hope you're having a great vacation Annika! :) thanks for having me! !